Experience scuba diving with Phuket Scuba Club during your next holiday in Phuket and explore the wonders of the world underwater. We did, and found it to be one of the best things to do in Phuket. As first time divers, this was a fantastic experience and one that we hope many others visitors will also discover when travelling to Phuket. Chantal and Kevan are the owners of the Scuba Club, and from the very first time we met them a few years back, we found them both warm and very welcoming. 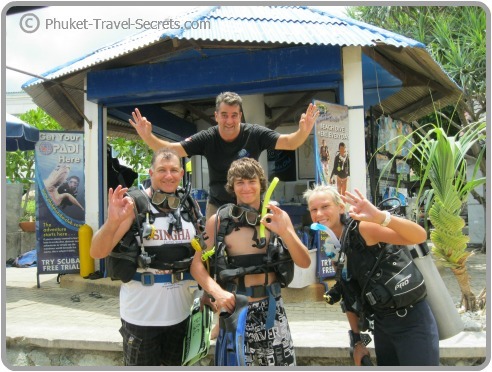 Both Chantal & Kevan know everything there is to know about scuba diving and are a great source of information about Phuket, having lived and worked on the Island for nearly 20 years. 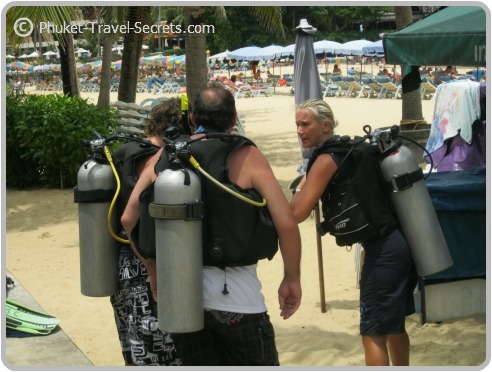 When we decided that we were going to go scuba diving on our most recent holiday to Phuket, we contacted Chantal, and she suggested that we would be best to do the “Discover scuba diving program”. This program is specifically designed for novice divers, and is an excellent program which allows you to explore the underwater world directly off the sands of either Kata or Karon Beaches. Safety is paramount; and the scuba diving club maintains strict training and safety standards with a team of professional and highly experienced diving instructors. Even though the club has strict safety standards, the diving instructors have a wonderful way of making your dive a fun and interesting experience. The Scuba Club offers a range of Padi and SSI scuba diving courses for all levels of experience, from beginners like us, to courses that are suited for more experienced divers. The scuba club also has scuba diving day trips to some of the best dive sites offshore from Phuket, including the beautiful Racha Islands and Phi Phi Islands. Also available are a range of live-aboard scuba diving cruises, these cruises can take you to other areas in Thailand including the Similian Islands and Burma. 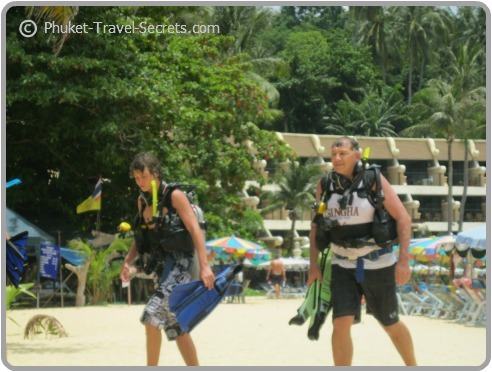 Phuket Scuba Club can be found at two different locations in Phuket. The main office is located in Koktanod Road at Kata and the other is directly on the beachfront at the southern end of Karon Beach. You can’t miss the Karon Beach office, it’s the blue hut in the picture at the top of the page. From our own personal experience, and the amount of return customers that we met during our time at the scuba diving club. We feel that we can recommend the professional services and extremely qualified diving instructors at Phuket Scuba Club for anyone who would like to go diving while in Phuket. For more information about the scuba diving courses available, scuba and snorkeling day trips as well as up to date prices, contact Chantal at Phuket Scuba Club.